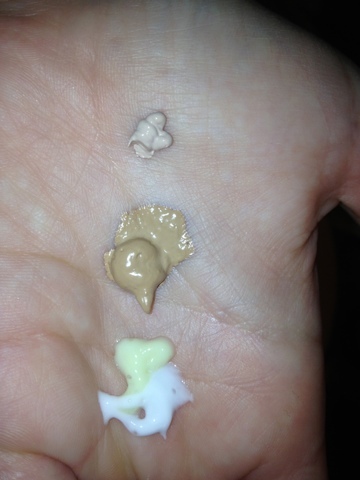 I’m no chemist, but I’ve been thinking a lot lately about mixing up my own perfect creation for a CC cream. I hear about people mixing their own foundations all the time, combining their favorite concealers, skincare, and foundations together for a perfect match. Do you remember my CC cream post from last week? CC stands for color correcting, and what I am looking for in a CC cream is natural looking coverage, lots of moisture, anti-aging benefits, and an even skin tone. What does one mix together when they’re looking for the perfect combination? I decided to mix together three ingredients- a dual action skincare cream that fights acne and wrinkles, a tinted moisturizer with SPF 30, and a full coverage, waterproof, anti-aging concealer. medium coverage corrects skin discoloration and blemishes. 100% pure argan oil is blended with pomegranate oil, goji berry extract, and natural papaya extract to rejuvenate and hydrate skin. Now that I have my products picked out, I mixed them in the palm of my hand, and applied directly to my face. Once the product was on my face, I took my Beauty Blender sponge, and diffused the mixture over my skin. Judging by these before and after pictures, I think this really created an effective CC cream! Mixing my own allowed me to embody the qualities I was looking for in my own custom mix. I will definitely do this again. I’m excited to try other combinations. Have you ever brought chemistry to your bathroom and mixed your own custom blended skin product? Let me know in the comments!